Alright, I’ll admit that I was attracted to this book because of the title: Jazz Maynard. For those of us who are jazz fans, this definitely captures our attention! Fortunately what’s inside is a strong story with attractive, stylized art. Backstory (which is shared in this volume): Jazz Maynard was a kid on the streets when, by a strange twist of fortune, he is looked after by a wealthy family. As he grows older, he recognizes that the family’s wealth likely doesn’t come from legal means and he convinces his ‘father’ to take him into the family business. There, Jazz becomes one of the strongest, fastest, smartest, most cunning, and easily the luckiest of criminals. Jazz has a ‘brother’ – Max, the natural son of his adopted family – who is just a little bit jealous of the attention Jazz has gotten. And the brother holds a bit of a grudge. At one time the father had planned his ‘swan song’ heist. A major theft that would be talked about for centuries, but when examining the plans, Jazz found a flaw and tried to convince his ‘father’ of it, but his pleas fell on deaf ears and of course the heist went sour. Now Max is looking to get back at Jazz. Meanwhile, Jazz has business in Iceland where, coincidentally, a group of criminals are practicing some ethnic cleansing. The worlds collide in a frantic, whirlwind of action and not a small amount of mythical mystery that will have the reader wanting to read more. I missed the first volume in this series when it came out, but I’m very glad to have picked up this volume. The story, by Raule, is like a carefully woven tapestry – sometimes in the past, sometimes in the present, sometimes with Jazz, sometimes focused elsewhere – but we’re never lost, only curious as to what else is happening, and Raule seems to know just when to change direction, keeping the reader hooked. The art by ‘Roger’ a stylized art that has become common in the 2000’s with sharp, angular features and deep shadows. It fits the mood of the book very well. I look forward to reading more in this exciting series. Looking for a good book? Jazz Maynard, Vol. 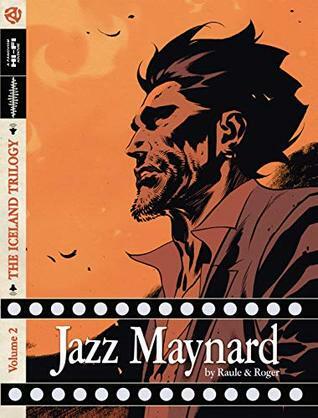 2: The Iceland Trilogy is a graphic novel of adventure and suspense with a touch of jazz and mythology to round out a unique story.